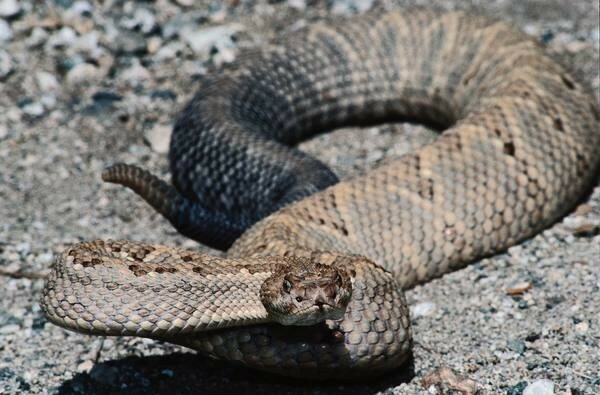 Rattlesnakes live in many types of habitats, such as mountains, deserts, and grasslands. (Rattlesnake1) They also live in forests. They don't migrate so they don't live outside out of their habitat they are born from. 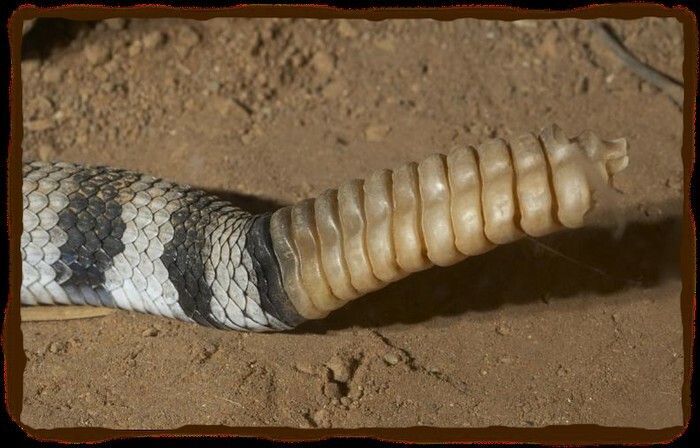 The habitat they live in needs to be warm because they are ectotherms (cold blooded) Rattlesnakes live in North and South America, especially in the southwestern U.S. and Mexico. ( Rattlesnake 3) But they also don't live with any other rattlesnake even if they are the same kind. This is a picture of him in one of his habitats. 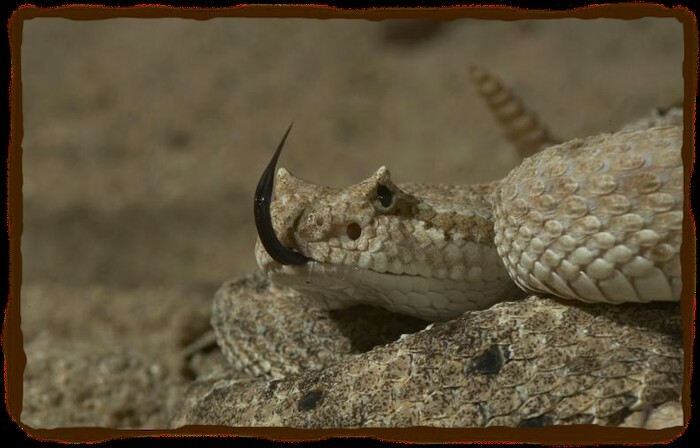 This is another picture of a rattlesnake in the desert. They do not migrate. They don't have legs or arms so they can't walk. But they don't use their head either. But they slither. They squeeze and relax the muscles on its side then it moves forward. They also move 5 miles (8 kilometers) per hour. So really when they move 1 mile it takes them 12 minutes. They don't swim,fly or jump either. They are typically gray, tan, or brown, with diamond-shaped patches or crossing diagonal lines or bands. They molt or shed their old skin. When they do they grow another layer of skin underneath, they peel off their old skin. (Rattlesnake 2). Some can have green, red, orange and pink colors on their bodies. (rattlesnake 3). They are a vertebrates. They also have scales on their bodies. Most of their diet is made out of lizards, but some rodents, birds, and centipedes. They also have a organ to help hunt in the dark. They have hinged jaws that allow them to consume food that is wider than their bodies. Even so, what a one eats depends on its size; generally, larger snakes eat larger food items. (Rattlesnake 4) Some can also eat their own kind. But it takes a while for it to digest so once they eat they usually don't eat for the next week. They usually will wait for the food or they will hunt the food. They have a layer of fat so they fill feed on that while they wait to digest. They also inject venom to paralyze their prey. (Rattlesnake5) But really they don't eat food, they swallow it whole. The intestine breaks the food down next. They lay eggs. Babies molt to get a new layer skin. When they do they also grow another layer of rattle.Female snakes give birth to up to 24 babies. These babies have very strong venom and are able to survive on their own right after birth. ( Rattle Snake 3).Young are born from July through September, and fend for themselves after hatching.Young snakes grow rapidly, and reach sexual maturity in two or three years. (Rattlesnake 4). They break out of their eggs using their tooth. They have organs that can sense any thing to eat in the dark. They are hunted down by other animals as well. 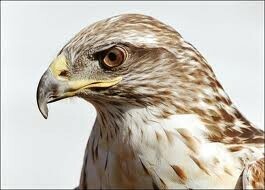 Such as people and birds of prey will try to attempt to hunt them. (Rattlesnake 6)The snake uses the rattle to warn other animals to stay away. However, rattlesnakes do not always rattle before striking. ( Rattlesnake 5). If a predator is near then they will make the rattle noise to warn them. If they still don't move away then it will attack the predator. But with prey, usually they will just strike the animal no matter what for food.But they will bite the animal if that animal scares him. They will in the winter gather together for warmth from freezing temperatures(in some areas, not all habitats will have winter, such as a desert). This hawk has the power to kill and eat a rattlesnake. Beatson, Robert R., and Martha L. Crump. "Tracking Rattlesnakes." Highlights for Children (Vol. 62, No. 8). Aug. 2007: 16-17. SIRS Discoverer. Web. 11 May 2016. "Control of Rattlesnakes." Internet Center for Wildlife Damage Movement. N.p., n.d. Web. 10 May 2016. <http://icwdm.org/handbook/reptiles/RattleSnakes.asp>. "Diamondback Rattlesnake." SIRS Discoverer. N.p., n.d. Web. 10 May 2016. <http://discoverer.prod.sirs.com/discoweb/disco/do/picture?picurn=urn%3Asirs%3AUS%3BIMAGE%3BTHM%3B0000164867>. Gill Jr., Paul G.. "Red on Yellow, Kill a Fellow!." Boys' Life. April 2004: 26-29. SIRS Discoverer. Web. 12 May 2016. "Hawks – The Fierce Hunter Birds." Easy Science for Kids. N.p., n.d. Web. 15 May 2016. <http://easyscienceforkids.com/all-about-hawks/>. Lambeth, Ellen. "Grab 'n' Gulp!." Ranger Rick. May 2003: 34-39. SIRS Discoverer. Web. 13 May 2016. Lee, David. "Prairie Rattler." Falcon. Jan./Feb. 1995: 28-32. SIRS Discoverer. Web. 15 May 2016. Lundgren, Julie K.. "Animal Adaptations." My Science Library: Animal Adaptations. 2012: 1-26. SIRS Discoverer. Web. 15 May 2016. Markle, Sandra. Outside and inside Snakes. New York: n.p., 1995. Print. O'Meara, Stephen James. "Revenge of the Headless Rattlesnake!." Odyssey. Dec. 1999: 4. SIRS Discoverer. Web. 15 May 2016. "Rattlesnake." SIRS Discoverer: Animal Facts. 2015: n.p. SIRS Discoverer. Web. 10 May 2016. "Rattlesnake." World Book Kids. World Book, 2016. Web. 15 May. 2016. "Rattlesnake." SIRS Discoverer. N.p., n.d. Web. 12 May 2016. <http://discoverer.prod.sirs.com/discoweb/disco/do/picture?picurn=urn%3Asirs%3AUS%3BIMAGE%3BTHM%3B0000053264>. "Rattlesnake." World Book Kids. N.p., n.d. Web. 15 May 2016. <http://www.worldbookonline.com/kids/home#animalsworld/reptiles>. "Rattlesnake on ground." Discovery Education. N.p., n.d. Web. 13 May 2016. 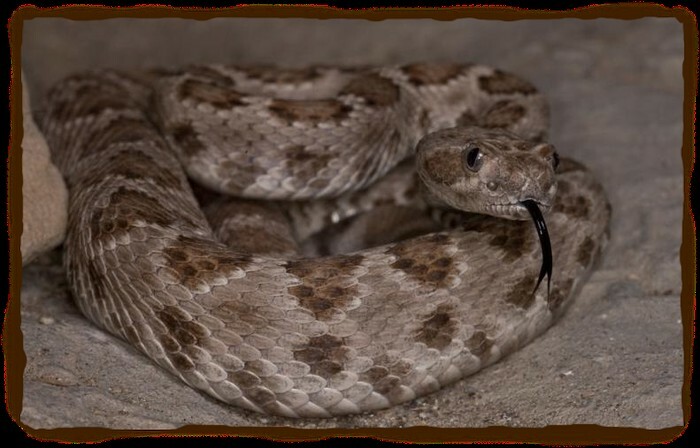 <https://app.discoveryeducation.com/search?Ntt=rattlesnake#selItemsPerPage=20&intCurrentPage=1&No=20&N=0&Ne=&Ntt=rattlesnake&Ns=&Nr=&browseFilter=&Ntk=&indexVersion=>. "Reptiles | Snake." San Diego Zoo Safari Park San Diego Zoo Home. N.p., n.d. Web. 12 May 2016. <http://animals.sandiegozoo.org/animals/snake>. "snake." Compton's by Britannica. 01 Aug. 2011: n.p. SIRS Discoverer. Web. 13 May 2016. Tilton, Buck. "Killer Critters." Boys' Life (Vol. 99, No. 5). May 2009: 30-33. SIRS Discoverer. Web. 12 May 2016. "WDFW LogoWashington Department of Fish & Wildlife WDFW LogoLiving with Wildlife." Living with Wildlife Snakes. N.p., n.d. Web. 12 May 2016. <http://wdfw.wa.gov/living/snakes.html>. "western diamondback rattlesnake." Compton's by Britannica. 01 Aug. 2011: n.p. SIRS Discoverer. Web. 15 May 2016. Whitaker, Rom. "Snake Safari." National Geographic Explorer!. Sept. 2004: 4-9. SIRS Discoverer. Web. 13 May 2016.